Light weight camping stoves are usually part of backpacking gear. Some may prefer to cook over a fire, while some may rather take along a stove for convenience or due to fire laws. Listed here are 4 that I found to have great reviews. is a very simple, compact, and inexpensive stove. It weighs about 3.25 oz, and is small enough to fit in your pocket. Six of the fuel tablets can store and be carried inside of the stove. The tablets burn for about 12 to 15 minutes. I did have one many years ago, probably still around somewhere, and my son used one when he was in the army. 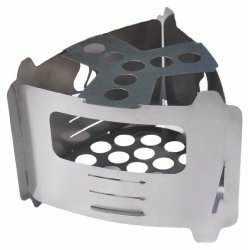 The reviews for this little stove the Dpower Ultralight Folding Backpacking Camping Stove are very good. It is said to be strong, sturdy, and stable. It can be use for small as well as large pots. such as Primus, an adapter can be used to hook it up to larger fuel tanks. It has an ignition that works well, while the valve can control the flame from simmer to boiling. And the price is good. The Bushbox Ultralight Outdoor Pocket Stove is a multi-fuel stove. Which is a great convenience. It can use wood, a trangia burner, Esbit/hexamine tablets, and gel fuel cans. Very light weight, weighs only 2.15 oz. It comes with a trivet so it can be used with all pot sizes. Very compact, because it travels flat and is assembled for use. Said to be of good build and quality, and snaps together easily. Has really great reviews. See the following YouTube review. 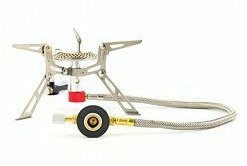 The last, but not least, is the Solo Stove Campfire and 2 Pot Combo Set, a lightweight wood burning rocket cooking system. This stove uses twigs, leaves, pine cones, and wood as fuel. Great if you don't want to take fuel canisters with you. The stove sits inside the pot set. The pot set includes a 1.5 and a 3 liter size pot. 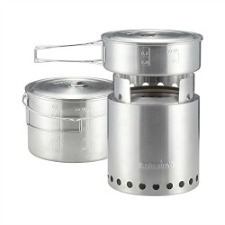 This solo camping stove has also received great reviews. However this stove costs about ten times (10 x) more than the Dpower stove above. A plus is that this stove comes in different sizes.